In this version I focused on selling items, experimented with new racial classes and made a bunch of fixes and small improvements. Now you can sell items you don’t need and what’s more important, you can buy them back if you decide you actually need them. In addition you have an option to deposit unneeded items in any inn which basically let’s you deal with unneeded items in two ways. I was also implementing new racial classes, the idea is each race would have two special classes available for them only (except half elves who share those with humans and elves). The racial classes are at the moment disabled since only some of them work, still you can check those. The last thing is a quick linguistic QA pass, so probably around 90% of spelling and grammar errors were fixed in this version. Therefore, from now on I’m starting to accept spelling error reports. – [feature] Can sell items to the shop and buy them back (for a small fee). – [feature] Deposit items in the inn (in a magic chest, accessible from any inn). – [misc] Healer’s restoration spell makes the target weakened (just like the ability), which is more consistent and logical. – [misc] Time runs slower when exploring indoors and during combat (it’s more realistic now). – [misc] Improved magic door’s description. – [misc] The first pass of linguistic QA finished, from now on I’m accepting spelling mistakes reports. – [misc] You can now see unfinished racial classes on new game screen, all of them are disabled in this version. – [design] Ogre Fort: Ghar – inaccessible grates fixed. – [interface] Shops display the number of master craftsmen rescued (which affect the availability of items). – [fix] Incorrect end game statistics (monsters killed, gold looted, etc). – [fix] Yet another Girdle of Carrying bug. – [fix] One potentially serious memory bug fixed. – [fix] Paralyzed characters able to train. – [fix] Elven healer cleanse removes weakened status but actual attributes were not restored. This entry was posted in Legends of Amberland, RPG on April 17, 2019 by Chris. This version introduces first customization options, things that would allow to adjust the game to your personal playstyle. For example you can enable fog on the minimap, start with fewer characters than 7 (which is not recommended) or adjust combat/animation speed. Griffin rules were adjusted to prevent abuse. The last big change was balance, it was changed a lot, based on the feedback I collected from early access players, which was basically that the game is too easy. If after the changes it turns out to be too hard, we can revert some of those in future versions. Of course eventually there will be Hard difficulty option so players with different skill levels can enjoy the game. – [feature] After Griffin landing monsters get a turn. – [feature] Can’t call a Griffin if monster within 3 tiles. – [feature] Option “Unrestricted Party Creation” (no restriction during party creation, can start with any number of party members). – [feature] Option / Controls (Combat speed) to adjust the combat speed. – [feature] Option / Controls (Animation speed) to adjust the animation speed. – [balance] Gold income from monsters and chests halved, increased shop prices. – [balance] Increased MP costs for magic. – [balance] Offensive spells made weaker (at higher mastery levels). – [balance] Characters have lower HP/MP numbers now. – [balance] Monsters base initiative +1 (they act earlier during the combat now). – [balance] Monsters deal bigger damage (especially high level ones). – [balance] Monsters have higher HP (especially high level ones). – [balance] All kinds of trolls now have an additional attack type which targets all characters (but that attack deals lower damage). – [interface] Option to enable fog on overworld minimap. – [interface] Minimap displays unvisited locations as “?? ?” instead of location names (like on the main map). – [interface] Dungeon map fully fogged when outside of boundaries (to avoid confusion of existence of some hidden passage). – [fix] After Griffin landing the tile is executed now (prevent Griffin teleport abuse, properly deal lava damage). – [fix] Bug in the main storyline. – [fix] Removed 0/0 invisible monsters from the overworld map (leftovers from the older map format used during alpha). – [fix] Combat initiative not reset upon reload/new game. – [fix] Starting characters sometimes had not fully restored HP/MP (attributes bonuses were not applied immediately). This entry was posted in Legends of Amberland, RPG on April 9, 2019 by Chris. This Early Access update focuses on adjusting things that were found confusing or unclear and introduces several balance tweaks. – [feature] Rest renamed to Quick Rest and Comfortable Rest to Full Rest, also adjusted the time passed while resting (more logical and intuitive now). – [feature] Added notice to magic doors to avoid confusion. – [balance] Rebalanced spells, overall those have more power but require more MP. – [balance] High arcane spells got less steep arcane requirements increase for mastery levels. – [balance] Damage from magic barriers, traps and lava tiles increased considerably. – [balance] Significantly reduced experience gain from level 10+ monsters (players were leveling the party way too fast). – [design] Added 2 new locations (eastern area). – [design] Adjusted magic dust availability and magic dust quest requirements. – [design] Adjusted ogre forts (grates placement less confusing). – [design] Added a new spell for Wizard, one for Ranger, two for Healer and one for Bard. Those are mostly high arcane spells available at higher levels. – [design] Added NPCs (in early inns) explaining how shops work (missing master craftsmen and the Guild). – [interface] Adjusted screen height per pixel values so it looks better (bigger pixels allowed) in windowed mode. Especially useful for people who play on windowed maximized mode (which BTW is not recommended since borderless is a way better mode). – [interface] More visible hotkeys (font color). – [interface] Shops made less confusing (added counter of master craftsmen available and a sell button which is disabled for now). – [fix] Magic Dust availability. 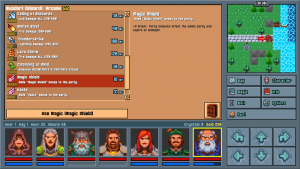 This entry was posted in Legends of Amberland, RPG on April 3, 2019 by Chris. 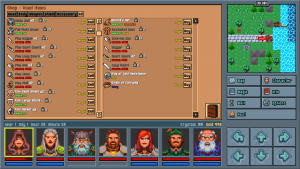 Legends of Amberland: The Forgotten Crown has been released as Early Access on Steam. This entry was posted in Legends of Amberland, RPG on March 26, 2019 by Chris. This entry was posted in Legends of Amberland, RPG on February 20, 2019 by Chris. This entry was posted in Legends of Amberland, RPG on January 25, 2019 by Chris. Legends of Amberland available for Wishlisting on Steam! The Steam Store page for Legends of Amberland: The Forgotten Crown has been set up. This entry was posted in Legends of Amberland, RPG on January 11, 2019 by Chris. This entry was posted in Legends of Amberland, RPG on January 8, 2019 by Chris. This entry was posted in Legends of Amberland, RPG on December 28, 2018 by Chris. December version introduces a new ironman mode “Surrounded by Traitors” which makes maintaining loyalty of imperial officials much more tricky. Especially over time since the loyalty degrades more when time passes when this ironman mode is selected. 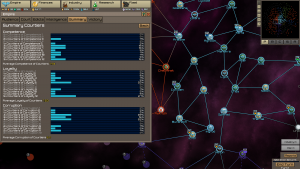 This version also introduces a new event related to loyalty and interface improvements. – [feature] Ironman mode: Surrounded by Traitors. Every 100 turns starting Loyalty of new imperial officials (courtiers, governors, officers) is reduced by -1 (up to -5), except political officers who are unaffected. Much higher chance for “Loyalty decreased” event. “Loyalty increased” event will never happen. – [feature] New very rare event “Loyalty decreased”. Each imperial official has 50% chance for Loyalty -1. Note that this event is much more frequent if Surrounded by Traitors ironmode is selected. – [interface] Summary of governors/courtiers/officers on Empire/Summary screen now also displays average competence/loyalty/corruption. – [interface] Additional accessories for imperial officials portraits (more earrings for females and a new data visor for males). Note that with old saves you might have some existing portraits changed and might see some odd overrepresentation of certain accessories, it’s just a cosmetic thing and affects old saves only. – [interface] Increased chance for accessories for female portraits. – [interface] Reverted back to the old faction icons (while the new ones were more sharp and visible, I have to agree with some concerns raised on the forum that the old more blurry ones are more consistent with the style of portraits and since factions icons are displayed mostly on portraits making them look good with portraits is a priority, plus the imperial eagle which is displayed on governors portrait is a blurred one, so I suppose it’s more consistent to make all over portrait icons with blurred versions). This entry was posted in New Version, Stellar Monarch on December 12, 2018 by Chris.